HEADQUARTERS ARMY OF THE POTOMAC, Camp near Falmouth, Va., April 30, 1863. It is with heartfelt satisfaction the commanding general announces to the army that the operations of the last three days have determined that our enemy must either ingloriously fly, or come out from behind his defenses and give us battle on our own ground, where certain destruction awaits him. The operations of the Fifth, Eleventh, and Twelfth Corps have been a succession of splendid achievements. S. WILLIAMS, Assistant Adjutant General. Something for the weekend. Mister Here’s Your Mule! The Civil War had a great many comic songs and one of the best was Mister Here’s Your Mule which was popular with soldiers on both side. Written in 1862 by C.D. Benson, the song swiftly became a campfire favorite. Probably the most realistic depiction of World War II combat put to film, The Battle of San Pietro, in the public domain, is now considered a minor masterpiece. At the time of its release in 1945 it was intensely controversial. Fought between December 8-17 in 1943, the assault of the 143rd Infantry of the 36th Division was filmed by Captain John Huston, who was making films for the Army, a rare case where the Army actually made use of the civilian expertise of one of its soldiers. Huston’s film shows war in all of its unglamorous horror. After the Hollywood depiction of war during World War II it came as an unpleasant revelation for viewers. Army brass were concerned about the film having a depressing effect on the morale of the troops. Army Chief of Staff, General George C. Marshall, however, came to the defense of the film, thinking that it would make a good training film, underlining to troops why they had to take their training seriously. The film was used in training and Huston was promoted to major. 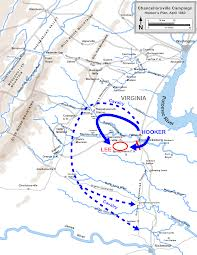 In reviewing the history of this ill-fated expedition, I am convinced that had we been furnished at Nashville with 800 good horses, instead of poor, young mules, we would have been successful, in spite of all other drawbacks; or if General Dodge had succeeded in detaining Forrest one day longer, we would have been successful, even with our poor outfit. One of the more unsuccessful raids of the Civil War, Colonel Abel Streight’s Mule Raid was filled with high drama and low comedy. Go here for a first rate video presentation of the raid. 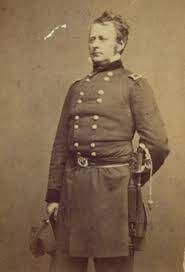 A bookseller in Indianapolis at the beginning of the war, Streight was Colonel of the 51rst Indiana Infantry in 1863. He hit upon the idea of a raid through Northern Alabama. 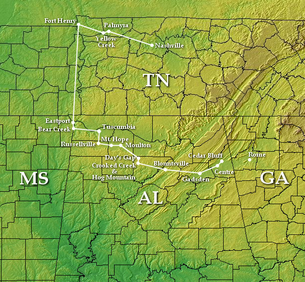 With Union loyalist Alabamians as guides, Streight planned to drive through Northern Alabama and on into Northern Georgia to destroy the rail hub of the Western & Atlantic Railroad, which would have cripple the ability of the Confederates to supply their forces in Tennessee. The raid was not intended as a cavalry raid, most of Streight’s force to consist of mounted infantry, their mounts being used for transportation and not to be fought from. 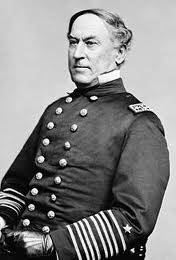 Streight was given command for his raid of a brigade of 1700 men, consisting of two companies of the First West Tennessee and First Alabama Cavalry regiments, and the Third Ohio, Fifty-First Indiana and Eightieth Illinois Infantry regiments.